The garden is winding down for the winter, and apart from trying to keep it tidy I don't have anything special planned. I've done a bit of work in the raised front garden, mainly tidying, a bit of planting and the rest of the time standing back with a cup of tea in hand and trying to decide what to do with such an oddly shaped space. There were a few shrubs around the edge, including a couple of rose bushes, geraniums, a small row of heathers, a large sedum and a massive, untidy heather, plus a couple of other unknown plants. 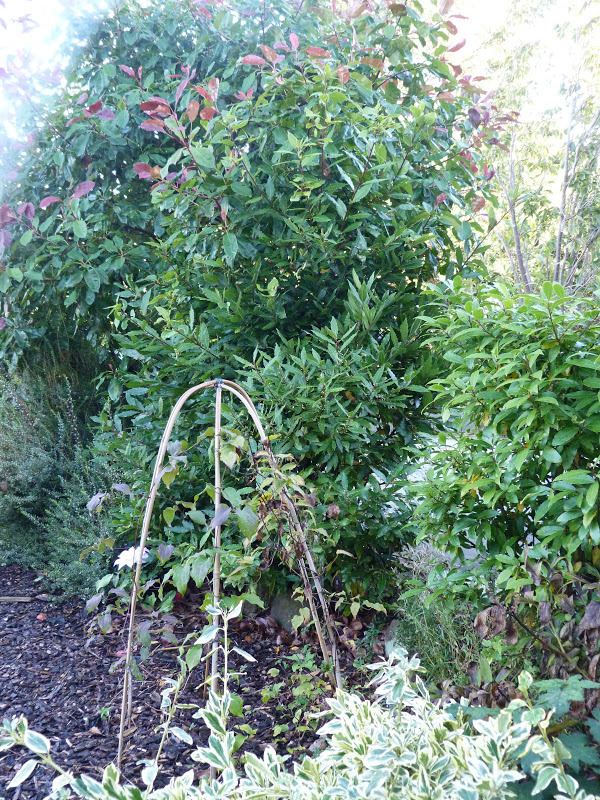 There's also a clematis plonked in the middle section, but nothing else....just lots of and lots of bark chippings. I'm really undecided what to do with it and the only thing I've decided is I'd like some colour. I'm open to suggestions - what would you do with this space? As I'm still waiting for inspiration to strike I decided to tidy up some of the shrubs and plant some spring bulbs ready for next year. I cut back a messy heather (which you can see at the front on the right) giving it a haircut as well as a severe pruning, and popped a new hebe in the bed next to it. When the hebe grows bigger I'll probably remove the heather altogether. 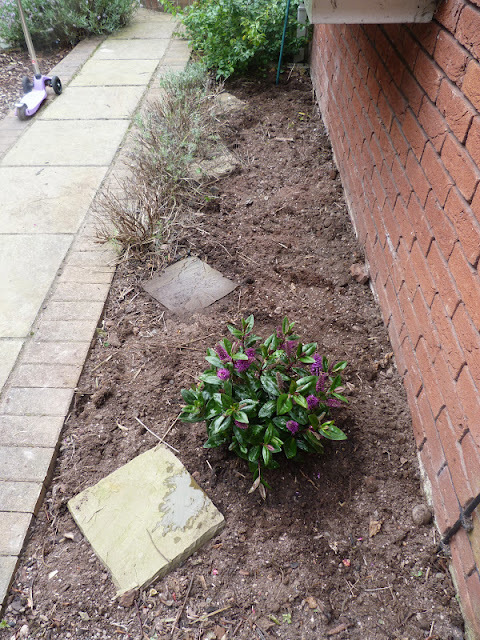 Cutting the heather back so much revealed more of the ugly manhole cover, but I also planted a lemon thyme at the front and a purple vinca minor to the side, hoping they will grow and cover it over a bit more. Here's the heather after a short back and sides and the newly planted hebe. 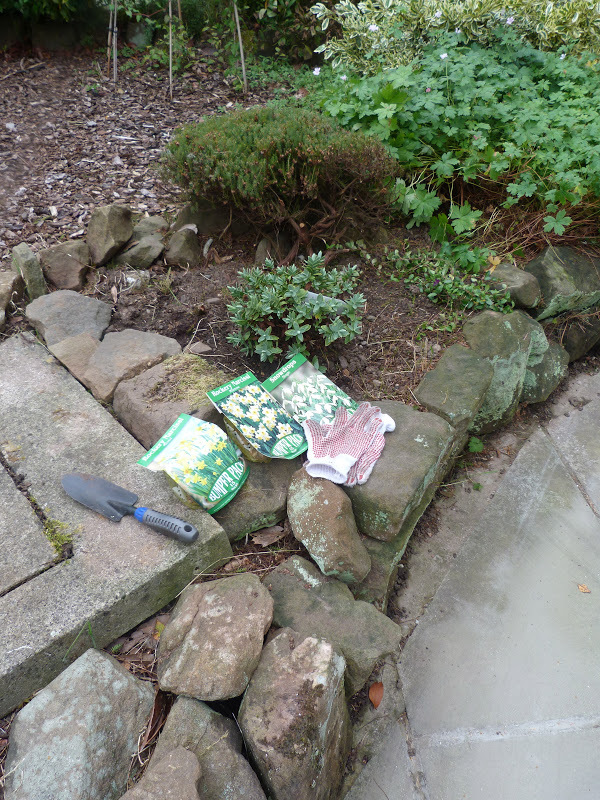 The spring bulbs went along the front of the rockery area. I had a nice surprise when the former owner came 'round to ask if they could take a cutting from one of the bay trees. One of the bay trees? I have bay trees? Yes apparently I do, behind the clematis (on the bamboo support) there are two overgrown bay trees, which they planted years ago and left to go a bit wild. So, now I have an abundance of bay leave folks, so if anyone fancies some for recipes I'm more than happy to post you a handful. Leave a comment and I'll be in touch!. I planted another flowering hebe in the back garden, in the flower bed under the living room window. Sorry I didn't get a 'before' photo, but you'll have to take my word that this bed was full of something resembling flowering nettles and unidentified straggly plants. I cut back the row of heathers, and also planted some of my favourites for next year - alliums christophii and purple sensation. I can't wait to see those beauties in flower. You may have noticed my love of hebes too. In my opinion, hebes are such a hardworking and low maintenance shrub that give structure and colour to a bed. I've already planted 3 new hebes in this garden since we moved in, and there'll be more.